A federal election to determine the members of the 44th Parliament of Australia took place on 7 September 2013. The centre-right Liberal/National Coalition opposition led by Opposition leader Tony Abbott of the Liberal Party of Australia and Coalition partner the National Party of Australia, led by Warren Truss, defeated the incumbent centre-left Labor Party government of Prime Minister Kevin Rudd by a 17-seat 3.6 percentage point two-party swing. Labor had been in government since the 2007 election. Abbott was sworn in by the Governor-General, Quentin Bryce, as Australia's 28th Prime Minister on 18 September 2013, along with the Abbott Ministry and the members of the House of Representatives. The 44th Parliament of Australia opened on 12 November 2013, which is taken to be the commencement of the term of members of the House of Representatives. The new senators were sworn in by the next Governor-General Peter Cosgrove on 7 July 2014, with their six-year terms commencing on 1 July. The proclamation dissolving the House of Representatives and formally beginning the election period had been issued by Governor-General Bryce on 5 August 2013. The writs of election were subsequently issued by Bryce for the election of members of the House of Representatives and the state governors for the senators for each state. Voting in Australia's federal elections has been compulsory since 1925. For the House of Representatives, a preferential ballot system has been in use since 1919, in single-member seats. For the Senate—the proportionally representative upper house—a single transferable vote system has been in use since 1949, with optional group voting tickets since 1984. Elections are conducted by the Australian Electoral Commission (AEC). A special half-Senate election was conducted on 5 April 2014 in Western Australia as a result of 1,375 lost ballot papers. The disproportionality of the lower house in the 2013 election was 9.66 according to the Gallagher index, mainly between the Coalition and Green parties. The Senate has 76 seats. Forty seats were up for election; six in each of the six states, two for the ACT and two for the Northern Territory. The terms of the four senators from the territories commenced on election day. The terms of the six longest-serving state senators ended on 30 June 2014; the terms of the new state senators commenced on 1 July 2014, and were originally supposed to end on 30 June 2020—however, the entire Senate was dissolved at the double-dissolution 2016 election. The Senate saw the Coalition government on 33 seats with the Labor opposition on 25 seats, the Greens on 10 seats and a crossbench of eight—Palmer United on three seats, with other minor parties and independents on five seats (the LDP's David Leyonhjelm, Family First's Bob Day, Motoring's Ricky Muir and incumbents Nick Xenophon and the DLP's John Madigan). Muir announced he would vote in line with Palmer United. The initial election saw Wayne Dropulich of the Australian Sports Party win a seat in Western Australia, but the subsequent voiding of the result and ensuing special election saw the Palmer United Party gain a third seat. The Coalition government required the support of at least six non-coalition Senators to pass legislation. A record number of candidates stood at the election. Group voting tickets came under scrutiny because multiple candidates were provisionally elected with the vast majority of their 14.3 per cent quotas coming from the preferences of other parties across the political spectrum. "Preference whisperer" Glenn Druery organised tight cross-preferencing between over 30 minor parties as part of his Minor Party Alliance. Sports' Wayne Dropulich won a Senate seat on a record-low primary vote of 0.2 per cent in Western Australia, his party placing 21st out of 28 groups on primary votes. Motoring's Ricky Muir won a senate seat on a record-low primary vote of 0.5 per cent in Victoria. Family First's Bob Day won a seat on a primary vote of 3.8 per cent in South Australia. All three were involved with the Minor Party Alliance. Previous examples of winning with low vote shares include Family First's Steve Fielding in 2004 on 1.9 per cent in Victoria, the Nuclear Disarmament Party's Robert Wood in 1987 on 1.5 per cent in New South Wales, and the DLP's John Madigan won his seat in 2010 on a primary vote of 2.3 per cent in Victoria. Xenophon and larger parties including the incoming government announced they would look at changes to the GVT system. Most Senate votes cast in Western Australia were subject to a formal recount. During the recount it was determined that 1,375 WA Senate ballot papers could not be located. After the final recount the result was duly declared which changed the last two predicted WA Senate spots from Palmer and Labor back to Sports and Green. Mick Keelty, a former AFP Commissioner, was requested by the AEC to investigate the issue of the misplaced ballot papers. On 15 November, the AEC petitioned the High Court, acting as the Court of Disputed Returns, to seek an order from the court that the WA Senate election of all six senators (3 Liberal, 1 Labor, 1 Green, 1 Sport) be declared void. On 18 February 2014, it was announced that the Court of Disputed Returns had found that the result of the Western Australia Senate election should be voided, meaning a fresh election for all six senate vacancies would be required. The AEC notes that the Court has advised in its written decision issued today that it finds that the only relief appropriate is for the 2013 Western Australian Senate election result to be declared void.......In accordance with the Australian Constitution and the requirements of the Western Australian Election of Senators Act 1903, an election of six senators for Western Australia would occur once a writ has been issued by His Excellency Mr Malcolm McCusker AC CVO QC, the Governor of Western Australia. On 28 February 2014 it was announced that the half-Senate election in Western Australia would take place on 5 April, which returned 3 Liberal, 1 Labor, 1 Green, 1 Palmer. On 30 January 2013, the then Prime Minister Julia Gillard had announced the election would be held on 14 September. However, following a leadership ballot in June 2013, she was replaced as leader and Prime Minister by Rudd, who then abandoned the originally planned date. A referendum on amending the constitution to allow the federal government to directly fund local councils, which was initially planned to be held on the same day as the federal election, could not go ahead on the date announced by Rudd. This is because Section 128 of the Constitution of Australia requires that a referendum be submitted to electors between two and six months after its passage through Parliament. As early voting started on 20 August it could not be submitted then. At the 2010 federal election, Labor and the Liberal/National Coalition each won 72 seats in the 150-seat House of Representatives, four short of the requirement for majority government, resulting in the first hung parliament since the 1940 federal election. On the crossbench, one member of the Australian Greens, one member of the National Party of Western Australia and four independent members held the balance of power. After gaining the support of the Greens and three independents on confidence and supply votes, Labor was able to form a minority government with 76 seats, the smallest possible margin in the 150-seat House. On 24 November 2011, Harry Jenkins resigned as Speaker of the House of Representatives and returned to the Labor backbench. Later, that day, Deputy Speaker Peter Slipper was elected Speaker and quit the Liberal National Party to become an independent. This changed nominal confidence and supply numbers on the floor of the house from 75–74 to 76–73. In January 2012, Andrew Wilkie withdrew his guarantee of confidence to the incumbent government, changing numbers to 75–73 in the event of his abstention, or 75–74 in the event of his support for a vote of no confidence in the government. In April 2012, Labor's Craig Thomson moved to the crossbenches as an independent MP, and in May, WA National Tony Crook moved from the crossbenches to the Nationals, but did not join the Coalition. Changes brought the government to 71 seats, the Coalition 72 seats and seven crossbenchers. On 9 October 2012, after an unsuccessful vote of no confidence in the speakership, Slipper resigned as Speaker and was replaced by Labor Deputy Speaker Anna Burke. Slipper remained an independent MP. Before the election, the 76-seat Senate was made up of senators from the Coalition (34), Australian Labor Party (31), Australian Greens (9), Democratic Labour Party (1) and one independent senator, Nick Xenophon. The Greens held the sole balance of power. Previously the Greens had held a shared balance of power with the Family First Party and Xenophon. Of the 76 Senate seats, 40 are contested. This corresponds to half of each state's allocation as well as both senators from the two major territories. Newly elected state senators commenced their terms on 1 July 2014 and the senators of the territories began their terms immediately after their elections. On 30 January 2013, at a speech at the National Press Club, Prime Minister Julia Gillard announced the election would be held on Saturday 14 September 2013, although the Governor-General was not formally advised and no writ of election was issued. Kevin Rudd succeeded Julia Gillard as Prime Minister on 27 June 2013.
b. (i) If, during an election period, a broadcaster broadcasts election matter, the broadcaster must give reasonable opportunities for the broadcasting of election matter to all political parties contesting the election, being parties which were represented in either House of the Parliament for which the election is to be held at the time of its last meeting before the election period. This is interpreted as "equal time, over time" rather than equal time in the same broadcast, and that this requirement began with the announcement on 30 January 2013. The terms of Members of the House of Representatives who did not renominate ended at the dissolution of the parliament (5 August 2013). The terms of Senators who did not renominate ended on 30 June 2014, unless they represented the Australian Capital Territory or the Northern Territory, in which case their term ended on the day before polling day (6 September 2013). That date also applies to territory senators who contest the election but are defeated. 30 January – Prime Minister Julia Gillard announces planned election date of 14 September 2013. 2 February – Attorney-General Nicola Roxon announces she will be retiring at the election. Higher Education Minister Senator Chris Evans, whose term was not due to finish until 2017, announces he will be resigning in the near future. 19 February – Greens leader Christine Milne announces that the alliance agreement with the ALP is over, but her party will not vote against confidence or supply. 26 February – Gillard announces she will "campaign" in western Sydney for the following week, from Sunday night until Friday. 19 March – Richard Torbay is forced to resign from the Nationals, forfeiting his candidature for the Division of New England. Barnaby Joyce puts his name forward as a possible replacement candidate, hoping to move from the Senate to the House of Representatives. 21 March – Former Labor leader, Minister Simon Crean asks Gillard for a party leadership vote, and publicly declares his support for Kevin Rudd. In parliament, the Opposition attempts to suspend standing orders for a no confidence vote and although gaining 73 votes to the government's 71 votes, fails to gain the absolute majority of 76 votes required. Crean is sacked from the ministry. At the leadership ballot no alternative candidate nominates, and Gillard is re-elected as ALP leader unopposed. Rudd supporters Joel Fitzgibbon, Ed Husic, Janelle Saffin and Richard Marles quit their positions in the executive government. 22 March – Rudd issues a statement that he will never again return to the ALP leadership. Kim Carr, Martin Ferguson and Chris Bowen quit their ministries. 23 March – Key independent MP Andrew Wilkie warns that ongoing instability within the ALP means the government will have difficulty surviving a vote of confidence when parliament resumes in May. 2 May – The opposition indicates it will support the Government's National Disability Insurance Scheme policy, including an increase in the Medicare levy from 1.5% to 2%. 26 June – Independents Rob Oakeshott and Tony Windsor both announce they won't recontest their seats at the election. Kevin Rudd defeats Julia Gillard in another Labor leadership spill by a 57–45 margin. After the spill, Gillard along with ministers Craig Emerson and Peter Garrett announce their retirement at the coming election. 27 June – Rudd is sworn in as Prime Minister by Governor-General Quentin Bryce, with Anthony Albanese and Chris Bowen sworn in as Deputy Prime Minister and Treasurer respectively. Defence Minister Stephen Smith MP announces his retirement at the coming election. 29 June – Greg Combet MP announces his retirement at the coming election. 1 July – The Second Rudd Ministry is sworn in. Simon Crean MP announces his retirement at the coming election. 1 July – Wikileaks party receives formal registration as a political party. 22 July – The ALP caucus approves changes to the way the federal parliamentary leader is chosen. The new rules make it more difficult to change leaders and require a ballot of the party membership on contested leadership spills. 4 August – Kevin Rudd announces the election date as 7 September 2013. 5 August – Quentin Bryce, the Governor-General, issues the election writ. 11 August – The first of three televised leaders debates between Rudd and Abbott is held in Canberra. 21 August – The second televised leaders debate between Rudd and Abbott is held in Brisbane. 25 August – The Coalition's formal campaign launch is held in Brisbane. 27 August – Treasurer Chris Bowen and shadow treasurer Joe Hockey debate at the National Press Club. Later that evening, the third and final televised leaders debate between Rudd and Abbott is held at the Rooty Hill RSL in Sydney. 28 August – The Coalition releases a document outlining $31.6 billion of proposed budget savings. 29 August – The Rudd Government releases several costings estimates which it claims show a $10 billion shortfall in the Coalition's claimed savings released the previous day. In a strongly-worded statement, the secretaries of the Department of Treasury and Department of Finance criticise the use of these confidential costings prepared for the government, re-iterating that the assumptions used differ from the costings prepared for the Coalition. 1 September – Labor's formal campaign launch is held in Brisbane. 5 September – The Coalition releases its remaining policy costings, claiming a further $9 billion worth of savings, including a $4.5 billion reduction in Australia's foreign aid budget. Later in the day, the Coalition releases a policy document announcing the implementation of an opt-out Internet filter. That evening, Shadow Communications Minister Malcolm Turnbull states that the document was "poorly worded" and released by mistake, and that the Coalition had no such policy. 7 September (Election Day) – The Liberal-National coalition defeats the Australian Labor Party with the Coalition expected to win about 90 seats in the House of Representatives. Kevin Rudd conceded defeat and announced that he would not renominate for the ALP's leadership. 18 September – The Abbott Ministry is sworn in by Governor-General Quentin Bryce. 17 October – A recount of all "above-the-line" Senate votes made in Western Australia is initiated after an appeal by the WA Greens and the Australian Sports Party is upheld. 31 October – The AEC announces that it is unable to find 1,375 ballot papers during the WA Senate recount. 31 October – The AEC declares Clive Palmer the winner of the seat of Fairfax, after two recounts, by a margin of 53 votes. Palmer claims the result vindicates his decision to challenge more than half the ballot papers cast. 4 November – The AEC declares the result of the WA Senate recount, awarding the last two seats to the Greens and Australian Sports Party, instead of the ALP and Palmer United Party. 15 November – The AEC disputes its own declaration of the WA Senate result, by lodging a petition with the Court of Disputed Returns, asking that the WA Senate result be declared null and void. January 2014 – Justice Kenneth Hayne, in the Court of Disputed Returns, hears submissions from the AEC and political parties. On 30 January 2014, Hayne reserved his decision. 20 February 2014 – The Court of Disputed Returns voids the results of the WA Senate election. 21 February 2014 – Electoral Commissioner Ed Killesteyn announces his resignation, to take effect on 4 July 2014. The incumbent Labor-led government argued for a need for a "safe pair of hands" to manage an economic shift from mining-oriented growth to something else; while the opposition said that it would prevent a recession that could be caused by a budget deficit. The Sydney Morning Herald suggested both arguments hedged on the mining boom going bust. Rudd officially began the campaign season on 1 September in his hometown of Brisbane. At the rally, he promised tax breaks for small businesses and more work for local contractors on infrastructure projects. He said: "In this election, we are now engaged in the fight of our lives. It is a fight about the values that underpin Australia's future, a fight about our vision for Australia's future. It's a fight about how we go about building Australia's future, a future for the many, not just for the few." He also dismissed the opinion polls that showed him trailing to Abbott in gaining a parliamentary plurality. Aggregate of voting intention polls between the 2013 election and the previous election. A moving average is shown in a solid line. The press overwhelmingly favoured the Coalition over Labor, with all of News Corp's publications endorsing Tony Abbott's opposition over Kevin Rudd's government, as well as Fairfax's publications such as The Age, The Sydney Morning Herald and The Canberra Times, backing the Coalition over Labor. Fairfax's newspapers, The Sydney Morning Herald and The Canberra Times both considered the need for political stability a primary reason for supporting the Coalition, as well as criticising Labor's continuing infighting and scandals. The Age backed Labor, praising Labor's stewardship of the economy during the global financial crisis and noting that, of the two parties, they were the one with a vision for Australia. The Sunday Age, however, supported the Coalition, rejecting their daily counterpart's editorial that Labor had vision and that the election amounted to choosing a lesser evil, noting that during the election campaign a "genuine contest of ideas [had] not materialised", that "the campaign [had] contained no vision or policy clarion call commanding our attention and demanding our vote" and subsequently that "in the absence of policies and detailed economic information, voter decisiveness will depend on one issue: trust." During this period, various News Corp's papers published numerous front-page articles supporting The Coalition and denigrating Labor. 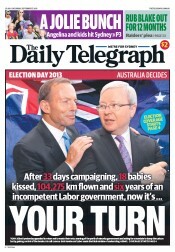 During the campaign, The Daily Telegraph ran front pages depicting Labor as Nazis, displaying a picture of Rudd above a headline telling readers to "Kick this mob out, and, on election day, ran the headline "After 33 days campaigning, 18 babies kissed, 104,275 km flown and six years of an incompetent Labor government, now it's... your turn." The Sunday Telegraph, meanwhile, printed an front-page editorial with the headline "Australia needs Tony". 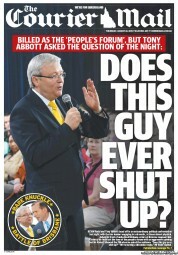 Additionally, The Courier-Mail used a front page to depict Labor as clowns, and ran a headline of "Does This Guy Ever Shut Up" alongside a photo of Rudd during a debate. Similarly, in the weeks preceding the election, the Herald Sun ran the headline "Trust Me" alongside a photo Abbott and on the day of the election ran a front page consisting of the headline "It's Tony's Time" alongside another photo of Abbott. The Labor Party recorded its lowest two-party preferred vote since 1996 and lowest primary vote since 1931. Kevin Rudd announced his resignation as party leader and confirmed he would not run again in the subsequent leadership election. With Nova Peris's victory in the Senate election in the Northern Territory, she became the first Aboriginal woman to be elected to parliament. WikiLeaks founder Julian Assange failed to be elected to the Senate after running in Victoria, with his WikiLeaks Party garnering 0.62% of the popular vote. Former Queensland Premier Peter Beattie, standing in the Liberal-held seat of Forde, also failed to enter parliament. In an unprecedented outcome in Australian electoral history, the Senate result in Western Australia was declared void after the loss of over 1,300 ballot papers, necessitating a fresh election for the Senate in that state. The Coalition had campaigned on a tough stance on asylum seekers who came to Australia by boat (as had the Labor Party in the final weeks leading up to the election). Immediately after the election, Abbott reiterated his party's promise and announced that his new government would begin Operation Sovereign Borders—which would turn back any vessels carrying asylum seekers—as soon as possible. He also confirmed he would abolish the carbon price that was introduced by the Gillard Government, as well as lower foreign aid by A$4.5 billion. ^ "2013 Federal Election Finally Complete". Australianpolitics.com. 7 July 2014. Retrieved 19 March 2018. ^ "WA Senate election to be held on 5 April". News.com.au. 28 February 2014. Retrieved 19 March 2018. ^ "First house preference by party". Virtual Tally Room: 2013 election. Australian Electoral Commission (AEC). 4 November 2013. Retrieved 28 November 2013. ^ "First Preferences by Group". Virtual Tally Room: 2013 election. AEC. 1 November 2013. Archived from the original on 12 October 2013. Retrieved 13 November 2013. ^ "Senate Results: Summary". ABC. 2013. Retrieved 13 November 2013. ^ "Australian Motoring Enthusiast Party Consolidates Support" (Press release). Australian Motoring Enthusiast Party. 10 October 2013. Archived from the original on 2 November 2013. Retrieved 13 November 2013. ^ Green, Antony (16 August 2013). "Record Number of Candidates to Contest 2013 Election". ABC News. Retrieved 13 November 2013. ^ Bormann, Trevor (5 September 2013). "Bitter dispute erupts over Senate preferences in Queensland: ABC 5 September 2013". Abc.net.au. Retrieved 19 March 2018. ^ "Glen Druery – the 'preference whisperer': ABC 21 August 2013". Archived from the original on 2 October 2013. Retrieved 29 September 2013. ^ Bridie Jabour. "'Preference whisperer' defends role in minor parties' Senate success: The Guardian 13 September 2013". Theguardian.com. Retrieved 19 March 2018. ^ "Western Australia 2013 Senate results and preference flows". ABC. Retrieved 19 March 2018. ^ Green, Antony (13 September 2013). "The Preference Deals behind the Strange Election of Ricky Muir and Wayne Dropulich". ABC News. Retrieved 13 November 2013. ^ "Australian Sports Party 'pleasantly surprised' by potential Senate seat: ABC 9 September 2013". Abc.net.au. 9 September 2013. Retrieved 19 March 2018. ^ "Victorian 2013 Senate results and preference flows". ABC. Retrieved 19 March 2018. ^ a b "Motoring Enthusiasts Party member Ricky Muir wins Senate seat: ABC 1 October 2013". Abc.net.au. 1 October 2013. Retrieved 19 March 2018. ^ "South Australia 2013 Senate results and preference flows". ABC. Retrieved 19 March 2018. ^ "Micro-manager behind independents: SMH 10 September 2013". Smh.com.au. 10 September 2013. Retrieved 19 March 2018. ^ "A ballot crammed with choice: SMH Tim Colebatch 5 August 2013". Smh.com.au. 5 August 2013. Retrieved 19 March 2018. ^ "Single-issue groups set to take balance of power: Canberra Times 9 September 2013". Canberratimes.com.au. 9 September 2013. Retrieved 19 March 2018. ^ "Coalition shy of Senate majority: Business Spectator 9 September 2013". Businessspectator.com.au. Retrieved 19 March 2018. ^ "Tony Abbott fires a warning shot at micro parties in the Senate". Watoday.com.au. 9 September 2013. Retrieved 19 March 2018. ^ "Xenophon wants voting reform: NineMSN 9 September 2013". Archived from the original on 17 January 2014. Retrieved 9 September 2013. ^ "Election results" (PDF). 2013 Electoral Pocketbook. AEC. 1 November 2013. Retrieved 13 November 2013. ^ "Most recently updated divisions, Senate: 2013 election, AEC". Archived from the original on 31 October 2013. Retrieved 30 October 2013. ^ Harrison, Dan; Hurst, Daniel; Ireland, Judith (31 October 2013). "WA Senate recount in turmoil as 1375 votes go missing". The Sydney Morning Herald. Retrieved 13 November 2013. ^ "Australian Electoral Commission statement: WA Senate recount" (Press release). AEC. 31 October 2013. Retrieved 13 November 2013. ^ Green, Antony (3 November 2013). "What's Going on with the WA Senate Count". ABC News. Retrieved 13 November 2013. ^ Green, Antony (8 November 2013). "WA Senate Contest Comes Down to Just 1 Vote – and it's one of the Missing". ABC News. Retrieved 13 November 2013. ^ Murphy, Katherine (15 November 2013). "Senate recount: electoral commission asks high court to nullify six WA seats". The Guardian. Australia. Retrieved 15 November 2013. ^ Ireland, Judith (15 November 2013). "Missing votes: AEC asks High Court to void WA Senate election". The Sydney Morning Herald. Retrieved 15 November 2013. ^ "Electoral Commission challenges WA Senate result to bring about fresh election". ABC News. 15 November 2013. Retrieved 15 November 2013. ^ "Statement from the Australian Electoral Commission: Court of Disputed Returns decision". Australian Electoral Commission. 18 February 2014. Retrieved 30 July 2016. ^ "Changing seats, 2013 election". ABC. Retrieved 19 March 2018. ^ online political correspondent Emma Rodgers (7 September 2010). "Labor clings to power". ABC News. Retrieved 8 September 2010. ^ "Slipper long plotted against us: LNP". The Sydney Morning Herald. 24 November 2011. Retrieved 17 March 2012. ^ Renee, By (27 November 2011). "How Labor lured Peter Slipper to Speaker's chair in Federal Parliament". News.com.au. Retrieved 17 March 2012. ^ a b Farr, Malcolm; Benson, Simon (30 January 2013). "Julia Gillard announces federal election date". News.com.au. Retrieved 3 February 2013. ^ a b David Crowe (2 February 2013). "Equal political broadcast time 'starts now'". The Australian. Retrieved 3 February 2013. ^ a b Griffiths, Emma (26 June 2013). "Tony Windsor and Rob Oakeshott announce they are quitting politics". Australia: ABC News. Retrieved 26 June 2013. ^ Maiden, Smanatha (29 June 2013). "Combet to quit politics at election". The Daily Telegraph. Retrieved 29 June 2013. ^ "Prime Minister Kevin Rudd's new-look ministry sworn into office at Government House – Rudd Returns". ABC News. 1 July 2013. Retrieved 11 August 2013. ^ "Craig Emerson resigns as MP, minister". Nine News. Australian Associated Press. 26 June 2013. Retrieved 26 June 2013. ^ "Martin Ferguson announces he will retire from parliament at next election". ABC News. 29 May 2013. Retrieved 29 May 2013. ^ "Garrett quits as Rudd returns". Nine News. Australian Associated Press. 26 June 2013. Retrieved 26 June 2013. ^ Thompson, Jeremy (29 August 2011). "Labor MP to retire at next election". ABC News. Retrieved 17 March 2012. ^ Griffith, Emma (26 June 2013). "Kevin Rudd defeats Julia Gillard 57-45 in Labor leadership ballot, paving way for a return to PM". Australia: ABC News. Retrieved 26 June 2013. ^ "Federal MP Sharon Grierson announces retirement". Newcastle Herald. 18 July 2012. Retrieved 18 July 2012. ^ "Jenkins announces retirement from politics". Australia: ABC News. 26 July 2012. Retrieved 26 July 2012. ^ Scott, Steven (27 November 2012). "Federal Labor Capricornia MP Kirsten Livermore announces she will not contest the next election". The Courier Mail. Retrieved 27 November 2012. ^ "McClelland to quit politics at next election". Australia: ABC News. 29 January 2013. ^ "Nicola Roxon to quit politics: reports". The Age. Melbourne. 2 February 2013. ^ Griffiths, Emma (27 June 2013). "Defence Minister Stephen Smith to retire from politics". Australia: ABC News. Retrieved 27 June 2013. ^ Swan, Jonathan (15 April 2013). "WA Labor senator Bishop to retire". The Age. Melbourne. Retrieved 26 June 2013. ^ Kenny, Mark (28 January 2013). "Crossin calls for NT stolen generation payout". The Sydney Morning Herald. Retrieved 30 January 2013. ^ "Senate President Hogg announces retirement". Australia: ABC News. 10 August 2012. Retrieved 10 August 2012. ^ "Lib MP to quit federal politics". ninemsn. 25 January 2012. Archived from the original on 26 January 2012. Retrieved 25 January 2012. ^ "News and Information from Western Australia's Kimberley Region, Kunnunurra news, Fitzroy Crossing News, Broome News, Derby News, Halls Creek News". Kimberley Page. 15 June 2013. Retrieved 26 June 2013. ^ a b "Mal Washer and Judi Moylan – True liberals in a conservative heartland". The Body Politic. 28 July 2011. Retrieved 17 March 2012. ^ "Alby Schulz to retire". The Sydney Morning Herald. 17 April 2012. Retrieved 9 January 2013. ^ "The World Today - WA Liberal climate change motion 'stupid': Washer". Australian Broadcasting Corporation. 15 August 2011. Retrieved 17 March 2012. ^ "Libs search for new senators". The West Australian. 10 April 2012. ^ Adcock, Frances (10 October 2012). "Bundaberg MP Paul Neville to quit". Retrieved 11 October 2012. ^ "Lib speaks for himself, defies gag by Abbott". The Canberra Times. 25 September 2010. Archived from the original on 27 September 2010. ^ "Veteran Boswell won't renominate for Senate". The Brisbane Times. 21 September 2012. ^ "Another LNP senator to retire". news.com.au. 8 October 2012. ^ "Veteran Nationals MP John Forrest retires". ABC News. 6 March 2013. Retrieved 6 March 2013. ^ "WA National Tony Crook to quit federal politics". The Australian. Australian Associated Press. 9 April 2013. Retrieved 13 April 2013. ^ Kenny, Mark; Wright, Jessica (2 February 2013). "Roxon, Evans shock resignations prompt cabinet reshuffle". The Sydney Morning Herald. Retrieved 20 February 2013. ^ Lion, Patrick; Farr, Malcolm (19 February 2013). "Christine Milne says Labor has walked away from its agreement with Greens". news.com.au. News Corp Australia. Retrieved 20 February 2013. ^ Maher, Sid; Shanahan, Dennis (27 February 2013). "Julia Gillard 'campaigning', not governing, in western Sydney". The Australian. ^ Salusinszky, Imre (20 March 2013). "Richard Torbay quits NSW parliament after being dumped from Nationals federal preselection". The Australian. Retrieved 20 March 2013. ^ Packham, Ben (20 March 2013). "Barnaby Joyce ready to take on Tony Windsor in New England after Richard Torbay is dumped". The Australian. Retrieved 20 March 2013. ^ "Julia Gillard wins leadership unopposed". Yahoo7. 21 March 2013. Retrieved 21 March 2013. ^ Robertson, James (21 March 2013). "Body count: Rudd supporters quit their posts". The Sydney Morning Herald. Retrieved 21 March 2013. ^ Packham, Ben (22 March 2013). "I'm giving up on leadership: Kevin Rudd". The Australian. Retrieved 22 March 2013. ^ Packham, Ben (22 March 2013). "Chris Bowen quits after failed leadership coup, Julia Gillard says more may go". The Australian. Retrieved 22 March 2013. ^ "Wilkie warns Labor over vote of no confidence". Gladstone Observer. 25 March 2013. Retrieved 26 June 2013. ^ Cullen, Simon. "Abbott supports NDIS levy, with conditions". Australian Broadcasting Corporation. Retrieved 13 May 2013. ^ AAP (2 May 2013). "Gillard welcomes Abbott support for NDIS". The Australian. Retrieved 13 May 2013. ^ Griffiths, Emma (1 July 2013). "Prime Minister Kevin Rudd's new-look ministry sworn into office at Government House". Australian Broadcasting Corporation. Retrieved 29 August 2013. ^ Scarr, Lanai (22 July 2013). "Kevin Rudd gets caucus support for changes to electing Labor leadership after rowdy protesters greet him". news.com.au. Retrieved 10 September 2013. ^ "Kevin Rudd wins Caucus support for Labor party reform at special meeting in Balmain". abc.net.au. 22 July 2013. Retrieved 10 September 2013. ^ Lanai Scarr; Samantha Maiden; Steve Lewis (4 August 2013). "Kevin Rudd calls a general election for September 7". news.com.au. Retrieved 4 August 2013. ^ "Australian election rivals Rudd and Abbott hold first debate". BBC News. 11 August 2013. Retrieved 11 August 2013. ^ "Rudd v Abbott: the debate in full – transcript". The Guardian. 11 August 2013. Retrieved 13 August 2013. ^ Clarke, Melissa (21 August 2013). "Debate Round 2 breathes life into leaders' dialogue". ABC. Retrieved 22 August 2013. ^ Kenny, Mark (22 August 2013). "Kevin Rudd breathes fire and brimstone into campaign". The Canberra Times. Retrieved 22 August 2013. ^ Abbott pledges trustworthy government, SBS News, 25 August 2013. ^ Griffiths, Emma (28 August 2013). "Abbott promises not to shut down Labor's Medicare Locals during Rooty Hill debate with Rudd". ABC News. Retrieved 29 August 2013. ^ Shadow Treasurer Joe Hockey reveals $31.6bn in Coalition savings, news.com.au, 28 August 2013. ^ Hall, Bianca: Labor campaign in 'tatters', says Coalition, as government defends costings claim, The Sydney Morning Herald, 30 August 2013. ^ Statement on Costings by the Department of the Treasury and the Department of Finance and Deregulation Archived 1 September 2013 at the Wayback Machine, Department of the Treasury, 29 August 2013. ^ Griffiths, Emma: Labor Party campaign launch to focus on jobs, small businesses and skills, ABC News, 1 September 2013. ^ As it happened: Coalition releases costings, Kevin Rudd speaks at Press Club, ABC News, 5 September 2013. ^ Grimson, Matthew: Malcolm Turnbull says Coalition will not introduce opt-out internet filter after earlier supporting it, ABC News, 6 September 2013. ^ Hopkin, Michael (17 October 2013). "WA Senate recount gets under way". The Sydney Morning Herald. Retrieved 28 October 2013. ^ AAP (31 October 2013). "Clive Palmer wins seat of Fairfax". ninemsn.com.au. Retrieved 18 November 2013. ^ Griffiths, Emma (4 November 2013). "AEC confirms WA Senate election result, apologises over 1,375 lost ballots". abc.net.au. Retrieved 5 November 2013. ^ Ireland, Judith (15 November 2013). "Missing votes: AEC asks High Court to void WA Senate election". The Sydney Morning Herald. Retrieved 18 November 2013. ^ "Court hears submissions to void WA Senate election after votes lost". Australian Broadcasting Corporation. 29 January 2014. Retrieved 30 January 2014. ^ "High Court judge reserves judgment on botched West Australian Senate election". Australian Broadcasting Corporation. 30 January 2014. Retrieved 30 January 2014. ^ a b "Court of Disputed Returns voids 2013 WA Senate election result". aec.gov.au. Retrieved 24 February 2014. ^ Bourke, Latika (2014). "Ed Killesteyn resigns as Australian Electoral Commissioner". Australian Broadcasting Corporation. Retrieved 23 February 2014. ^ David Potts (18 August 2013). "Vote of confidence as signs improve". The Sydney Morning Herald. Retrieved 19 August 2013. ^ "Australian PM makes final campaign pitch". Al Jazeera. Retrieved 3 September 2013. ^ "Australians deserve a government they can trust". The Sydney Morning Herald. Retrieved 10 November 2017. ^ "Abbott's time, but Canberra will need to fight to be heard". The Canberra Times. Retrieved 10 November 2017. ^ "No vision or inspiration, so who do you trust to govern?". The Sunday Age. Retrieved 10 November 2017. ^ "The Tele nails its colours to its masthead". Australian Broadcasting Corporation. Retrieved 10 November 2017. ^ "The final Tele tally". Australian Broadcasting Corporation. Retrieved 10 November 2017. ^ "Daily Telegraph Front Page 7 September 2013". The Daily Telegraph. Retrieved 10 November 2017. ^ "Political front page causes a stir". Australian Broadcasting Company. Retrieved 10 November 2017. ^ "Prime Minister Kevin Rudd begs spinner Peter Beattie to help rescue Labor". The Courier Mail. Retrieved 10 November 2017. ^ "The Courier Mail Front Page 22 August 2013". The Courier Mail. Retrieved 10 November 2017. ^ "The Herald Sun Front Page 12 August 2013". The Herald Sun. Retrieved 10 November 2017. 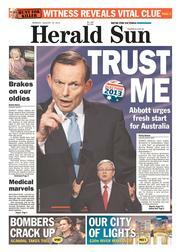 ^ "The Herald Sun Front Page 7 September 2013". The Herald Sun. Retrieved 10 November 2017. ^ "Australia election: Tony Abbott defeats Kevin Rudd". BBC News. 7 September 2013. Retrieved 8 September 2013. ^ McGuirk, Rod (8 September 2013). "First aboriginal woman wins Australian parliament seat; campaign brought racism". CTV News. Associated Press. Retrieved 8 September 2013. ^ "Julian Assange: WikiLeaks party will continue". The Guardian. Australian Associated Press. 8 September 2013. Retrieved 9 September 2013. ^ "As it happened: Day four dominated by return of Peter Beattie, as Rudd-Murdoch war heats up". Abc.net.au. 8 August 2013. Retrieved 19 March 2018. ^ "AEC confirms WA Senate election result, apologises over 1,375 lost ballots". ABC News. Retrieved 5 November 2013. ^ "Australia's PM-elect Abbott vows quick action on asylum". BBC News. 8 September 2013. Retrieved 9 September 2013. ^ Williams, Rob (8 September 2013). "Australian election: Victorious Tony Abbott vows to cut foreign aid and tackle immigration". The Independent. London. Retrieved 9 September 2013. This page was last edited on 10 April 2019, at 22:40 (UTC).